Breed to Succeed......We Breed, You Win ! ABC Sport Horses is a mid-sized breeding operation located in County Carlow, in the south east of Ireland. It is situated 1 hours drive from Dublin and approximately 20 minutes drive from Goresbridge Horse Sales. Our aim is to breed top quality, high class Irish bred showjumping horses and eventing horses using the best available stallions that will cross well with our performance related broodmares. Due to her world class breeding and super performance record, future breeding plans will be largely based around Ardnehue Diamond Cruiser. Despite numerous offers for Ardnehue Diamond Cruiser from both national and international riders it was decided to hold onto her for breeding and reverse the old trend whereby the best mares were sold out of the country. While we would like to keep to a traditional Irish breeding programme, we do use some of the best continental bloodlines for that extra performance factor. A lot of thought and research goes into choosing the stallions to be used on the broodmares. Sound advice and opinions are sought each spring and we hope all this will help us to achieve our ultimate goal........to breed an OLYMPIC CHAMPION ! BREED THE BEST TO THE BEST AND HOPE FOR THE BEST ! Pedigree : Cruising X Diamond Lad X Arctic Que. Ardnehue Diamond Cruiser was purchased as a three year-old and initially the plan was to start breeding from her immediately. However, on showing her talents over a fence when lunged it was decided to break her and realise her true potential. She was very easy to break and showed a willingness to learn from the start. Due to her good looks, her breeding and her ability to jump she was the subject of much admiration at the shows she competed at. She had tremendous scope, carefulness, was very quick off the floor and was always 'mad' for jumping. She was very athletic and had great 'use' of herself. During her 4yo and 5yo seasons she was ridden by Roddy Dean, he being in the saddle when winning the Cavan Classic 5yo Championship. Francis Connors took up the reins for her 6yo season culminating in a fourth placing in the Horse Sport Ireland 6yo Championship at the RDS Dublin Horse Show in 2009. Such was her good temperament that she quickly became a favorite in both yards. Thanks to all concerned in both yards for the excellent care that she received. An embryo was taken from her in 2008 resulting in a colt foal in 2009. She is now retired from showjumping and started her breeding career in earnest in 2010.Initially she will be bred to a warmblood stallion and hopefully at some stage to an Irish or thoroughbred stallion. Ardnehue Diamond Cruiser is a blood type, bay mare all of 166 cm. She has good conformation, an excellent temperament and she passed all her soundness exams. One of Ireland's top international showjumping riders jumped her as a 5yo and said that ''she is a very exciting mare with definite international prospects''. When the opportunity was presented to purchase Ardnehue Diamond Cruiser's full sister and their dam, it was duly taken up. Her dam could be described as a quality half-bred type while her full sister is very much a blood type mare. 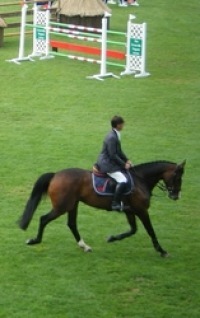 2nd Hackenburg 1996, 3rd Frankfert 1996, 4th Aachen 1997. Millstreet 1997 & 1998, Geneva 1998. See 'Video' page for AACHEN GRAND PRIX win 1999.